Do you need a cost-effective server that can keep pace with your data growth while providing options to manage and deliver performance? The HPE ProLiant DL180 Gen9 Server delivers an optimized 2U server, designed with the right balance of expandability, performance, reliability and manageability all in a new compact chassis, making it the ideal platform for SMBs and Enterprises running the "New Style of IT", applications such as Hadoop, Cloud and mobility applications which need right mix of compute and storage. The HPE ProLiant DL180 Gen9 Server provides ample storage capacity on demand with drive configurations ranging from (4) to (12) Large Form Factor (LFF) or (8) to (16) Small Form Factor (SFF) HPE SmartDrives, with flexibility of LFF non-hot plug (NHP) options at the right economics. It supports up to two Intel® Xeon® processor E5-2600 v3/v4 processors with up to (12) cores and (16) DIMM slots of HPE DDR4 SmartMemory offering improved performance and efficiency. Comes standard with 2x1GbE and choice of HPE FlexibleLOM or PCIe standup 1GbE or 10GbE Adapters provide you flexibility of networking bandwidth and fabric so you can adapt and grow to changing business needs. Up to six PCIe 3.0 riser slots to support a wide range of GPUs and networking cards offering increased IO bandwidth and seamless expandability. 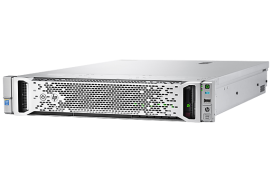 The HPE ProLiant DL180 Gen9 Server supports HPE SmartDrive technology which improves serviceability and prevents data loss with features, such as, self-describing LEDs and a Do Not Remove icon. HPE SmartMemory prevents data loss and downtime with enhanced error handling. Support of up to 512 GB max capacity with speeds up to 2133 MHz with up to 14% performance gain. 80 PLUS certified entry-level redundant HPE Power Supplies provide up to 92% efficiency which combined with HPE power management features leads to reduction of power consumption. Improved ambient temperature standard with ASHRAE A3 and A4  helps customers reduce cooling expense. 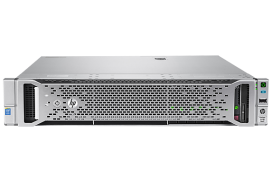 With HPE ProLiant DL180 Gen9 Server, HPE OneView provides infrastructure management for automation simplicity across servers, storage and networking. Configure in UEFI boot mode, provision local and remote with Intelligent Provisioning and Scripting Toolkits.